vowe dot net :: Is it a feature? Paul thinks it's a bug. Others disagree. Bug. The Jimmy Wales banner is missing. How they arrived at the conclusion that building client software on top of the Eclipse platform is beyond me. How they arrived at the conclusion that building client software on top of the Eclipse platform was a good idea is beyond me. Well there was a lot of abandoned IBM Lotus Workplace code that IBM could just recycle for Lotus Notes. 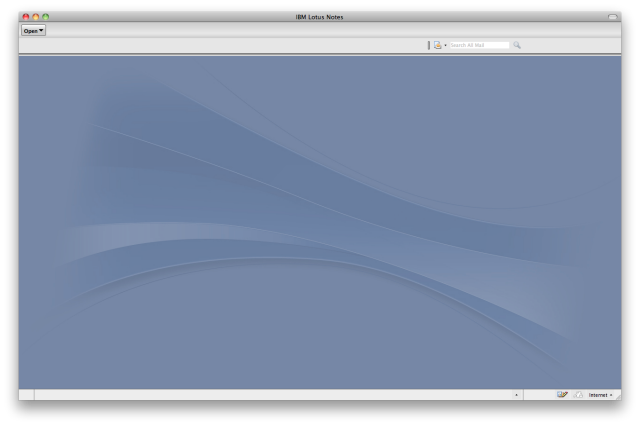 Comparing 8.0 with 8.5.2 IBM Lotus Notes Standard really made progress (that cannot be seen in the screenshot above). In some way IBM has already recognized that the idea probably was "not so good". If you look at Vulcan (the next big thing at IBM) demos presenters switch from the Eclipse client to a browser with only marginal difference in appearance and features (e.g. in this YouTube video with Ron Sebastian). By the way what has been considered a feature by some also has been a bug that I often saw before 8.5.2. If your client configuration becomes corrupt (for some reason that is beyond my imagination) your client sometimes will hang with a blank screen. Obscure techniques like deleting the workspace folder in your client setup cured the problem in most cases. I really think that it was a very good idea to use eclipse for the client products. Ok there are still some bugs in the client, but you can do so many things to extend the client in a way which was never possible before. So i can accept a few bugs especially if the bug is such a minor one like the bug shown here. I hope that IBM will continue the development of the Expeditor client because all our new applications are based on the Eclipse technology.